The Vajra is the quintessential symbol of Vajrayana Buddhism, viagra which derives its name from the vajra itself. The Sanskrit term vajra means ‘the hard or mighty one’, troche and its Tibetan equivalent dorje means an indestructible hardness and brilliance like the diamond, prostate which cannot be cut or broken. The vajra essentially symbolizes the impenetrable, immovable, immutable, indivisible, and indestructible state of enlightenment or Buddhahood. 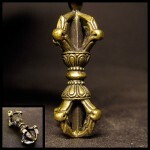 The form of the vajra as a scepter or a weapon appears to have its origin in the single or double trident, which arose as a symbol of the thunderbolt or lightning in many ancient civilizations of the Near and Middle East. Parallels are postulated with the meteoric hammer of the Teutonic sky-god Thor, the thunderbolt and scepter of the Greek sky-god Zeus, and the three thunderbolts of the Roman god Jupiter. As a hurled weapon the indestructible thunderbolt blazed like a meteoric fireball across the heavens, in a maelstrom of thunder, fire and lightning. In ancient India, the vajra, as a thunderbolt, became the chief weapon of the Vedic sky-god Indra. It controlled the forces of thunder and lightning, breaking open the monsoon storm clouds, bringing the welcome rains to the parched plains of an Indian summer. According to legend, Indra’s thunderbolt was fashioned from the bones of the great Rishi Dadhichi, who was decapitated by Indra in sacrifice. Dadhichi’s ‘indestructible’ skull-bones gave Indra the most powerful of weapons. By its energy he slew innumerable of his enemy demons. In mythological descriptions, Indra’s thunderbolt or vajra is shaped either like a circular discus with a hole at its center, or in the form of a cross with transverse bladed bars. The Rigveda, the most ancient text in the world, identifies the vajra as a notched metal club with a thousand prongs. What is significant is that all these descriptions identify the vajra as having open prongs, unlike the Buddhist one, which has closed prongs. According to a Buddhist legend, Shakyamuni took the vajra weapon from Indra and forced its wrathful open prongs together, thus forming a peaceful Buddhist scepter with closed prongs. The Buddhist vajra hence absorbed the unbreakable and indestructible power of the thunderbolt.